The global production of wine in 2017 will fall to its lowest point in 56 years following inclement weather across western Europe that damaged vineyards in the largest wine production region in the world, announced OIV the international wine organization on Tuesday. Worldwide output of wine is expected to drop to 246.6 million hectoliters during 2017, which is down 8% from 2016, the Paris-based OIV (International Organization of Vine and Wine) said in its release of first estimates for 2017. One hectoliter is equal to 100 liters, or slightly more than 133 standard size wine bottles that are 75cl. in size. The worldwide decline reflects the plummet in the output across the European Union, where the top three wine producers in the world – France, Italy and Spain – have each projected sharp drops in production. The executive branch of the EU, the European Commission, has estimated that the harvest of wine grapes for the bloc, will contract to a low of 36-years during 2017, as the foul weather from frosts last spring and heatwaves during the summer took their toll. In France, weather has affected the majority of the biggest growing regions including Champagne and Bordeaux, and the French government projected that production would drop to lows of many decades. The projections by the OIV, which exclude juice as well as new wine known as must, put wine production in Italy down by 23% at just over 39.2 million hectoliters, French output down over 19% to just over 36.6 million hectoliters and Spanish down 15% to more than 33.4 million. Lower global production might erase the surplus over demand that has been seen during recent years, when the consumption was less due to the financial crisis that hit worldwide in 2008. The OIV announced that it was assuming initially that the consumption range would be between 240.5 million and 245.8 million hectoliters based upon the trends over the medium and long term, but had not yet had any firm data on demand for 2017. Nevertheless, the impact of less production on the actual supply in the market and prices is dependent upon the levels of stocks from previous harvesting and the wine quality in the landmark regions. In France, the leading exporter of wine by value in the world, producers have hinted at good quality wine. 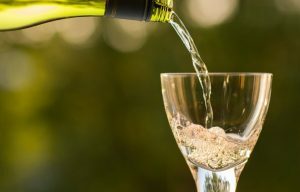 The U.S., the fourth largest wine producer in the world, and the world’s largest consumer, expected output to be little changed or down approximately 1%.